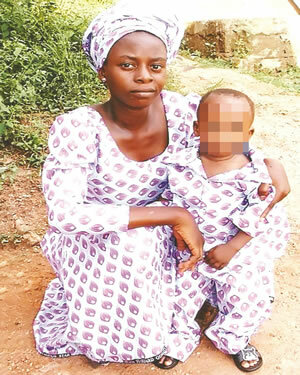 The police in Ogun State have arrested a 26-year-old woman, Funmilayo Tijani, who allegedly stabbed her two-year-old son, Emmanuel, to death in the Sango Ota area of the state. It was learnt that Funmilayo, a fashion designer, and her husband, identified simply as John, separated two years ago as a result of a quarrel. It was gathered that Funmilayo had returned to stay in her father’s apartment with her only child after the separation. It was learnt that on May 27, at about 4pm, Funmilayo’s neighbours on Ogunso Street, Orelope Estate, in the Egan, Sango area, noticed that she held a bloodstained knife and saw Emmanuel in a pool of blood. The incident was reported at the Sango Police Division. A resident of the area, Akeem Ijaola, said the boy died before he could be rushed to a hospital. He said, “Funmilayo and her son stayed with her father in a one-room apartment. The boy attended a private school in this area. About 4pm on the fateful day, we noticed that something was going wrong in the apartment. “When people went near, they saw the boy in a pool of blood. He had been stabbed many times. Funmilayo at that time looked like a mentally-derailed woman. The boy died before anyone could take him to a hospital. The suspect’s father, identified simply as Adebayo, said he was at a loss over Funmilayo’s action. The 53-year-old indigene of Ikare Akoko, Ondo State, said, “Funmilayo’s mother died about 20 years ago. She grew up staying with me. I married a second wife later, but separated from her years ago. Funmilayo had been staying with me since she separated from her husband. Another neighbour, who spoke on condition of anonymity, said Funmilayo might have committed the act out of frustration as she was financially and emotionally unstable. She said, “She tried to borrow money during that week from her boss, but she failed. There are also arguments whether her husband was the father of the boy or her father, who she stayed with. The Police Public Relations Officer, DSP Muyiwa Adejobi, confirmed the incident. He added that the police had deposited the corpse in a morgue.